Tinuku - North Korean leader Kim Jong-un offered to dismantle his nuclear weapons program within two years when he met with South Korean President Moon Jae-in last spring, a top U.S. administration official said Monday. According to U.S. National Security Adviser John Bolton, Kim made the proposal during his first meeting with the South Korean leader in April. He then backed down and accepted Moon's counterproposal to denuclearize within a year. "He said we can do it in two years. Moon Jae-in said to Kim Jong-un, and President Moon told this to President Trump, Moon Jae-in said, 'Well, why don't we do it in one year,'" Bolton said in a speech to the Federalist Society. Kim agreed, Bolton said, adding that that caused him to remark in the past about pushing for denuclearization in a year. The hawkish security adviser has long expressed skepticism about North Korea's promises to denuclearize. South Korean officials met with Kim in Pyongyang last week to arrange a third meeting between Moon and the North Korean leader. Kim was quoted as saying that he is still committed to denuclearization of the Korean Peninsula and would like to see it happen before the end of Trump's first term in early 2021. "In meeting with Kim Jong-un in Singapore a few months ago President Trump tried to hold the door open to Kim Jong-un and his regime. 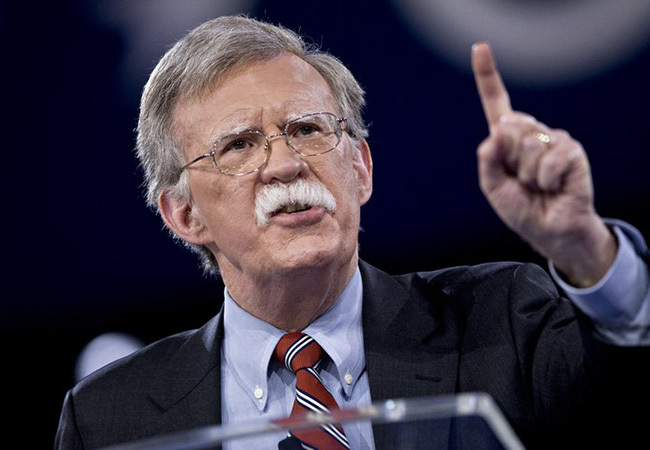 If they would denuclearize as they committed to do in Singapore, they could have a very different kind of life in North Korea," Bolton said. "Now the possibility of another meeting between the two presidents obviously exists, but President Trump can't make the North Koreans walk through the door he's holding open. They're the ones that have to take the steps to denuclearize and that's what we're waiting for." Bolton added. The White House said Monday that Kim sent a letter to Trump requesting a second meeting, and that planning is already under way.